GamingExaminer.com brings our attention to a scavenger hunt-style event coming to Star Wars: The Old Republic. 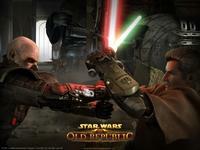 Check out the videos and description from SWTOR.com. "For a short time only, The Chevin Conglomerate is offering great riches to anyone who brings them rare and unique items. Scattered across all parts of the galaxy, these items must be retrieved before the Chevin return to their home in the furthest reaches of the Outer Rim! Be cautious as some within both the Republic and Imperial governments wonder if there is something more sinister driving the Chevin and their quest to acquire these goods..."